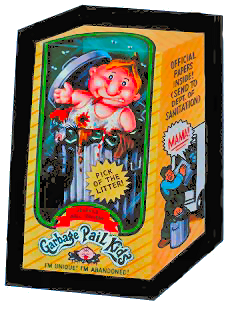 The 1st Series Garbage Pail Kids (aka OS1 GPK; Original Series) were released by Topps to a slow response from the public. A test release was sold around the New York area with growing interest - slowly, mainly by word-of-mouth, the packs began to sell. 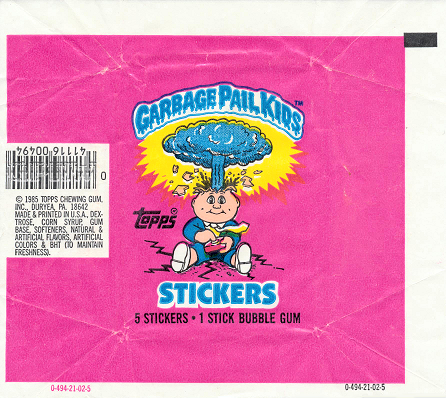 The first wrapper version contains the '25¢' logo on the pack - this is the suggested retail price (SRP) for a wax pack of 5 stickers and a slab of gum. 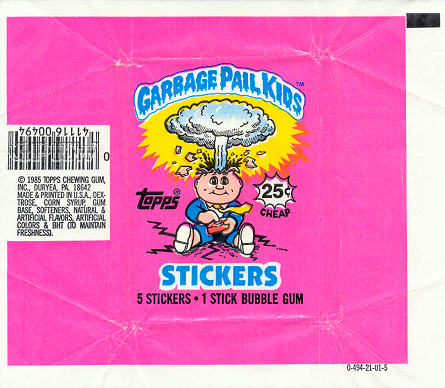 The second wrapper version does not contain the '25¢' logo on the pack; the hobby store owner could then choose and apply their own price. Both box versions of the 1st Series through the 15th Series of GPK, can be found with or without a 10x14 advertisement poster that the retailer could display in their window. 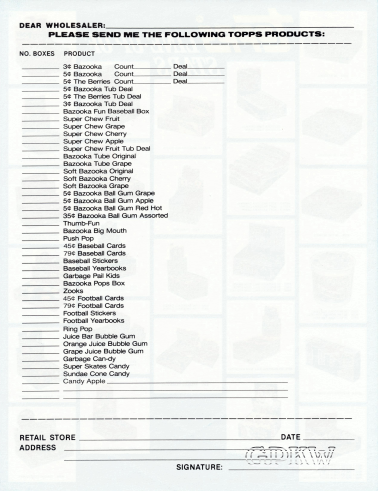 The 1st through 15th Series sets also have a seller ad sheet used by wholesalers to solicit orders from their retailers; these are not always series-specific. 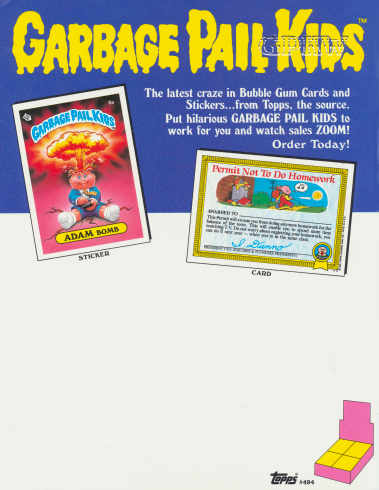 The 1st Series box is the only series so far that can be found with a box dealer insert ad -- that is GPK related. The cards in both versions of the 1st Series are the same except a gloss or matte finish back can be found as well as an asterisk (*) or two asterisks (**); both printing anomolies. 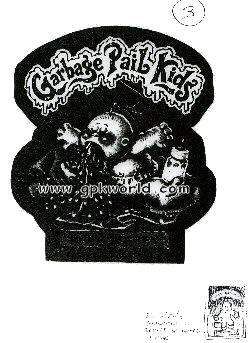 The Garbage Pail Kids trademark was filed on January 15th, 1985 with the registration number '1359512' for goods and services; "candy and chewing gum sold alone and in conjunction with stickers". 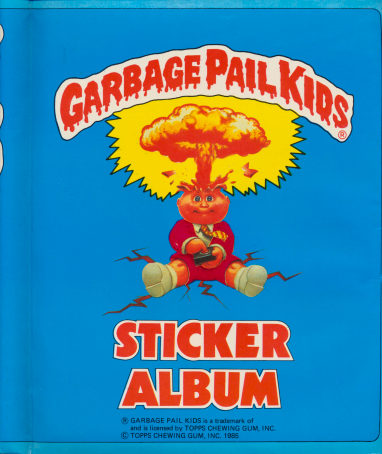 The first date Garbage Pail Kids word mark was used anywhere or in commerce was November 11th, 1984; wrapper mock-up, et cetera. The concept and greenlight for the series happened late in 1984 and took a good six months to create the first set. The trademark was approved for publication on March 3rd, 1985 and the 1st Series was released in May of 1985 (testing period). The registered trademark ® registration date occured on September 10th, 1985 which started to show up on packaging and card for the 2nd Series released in October of 1985. 1. 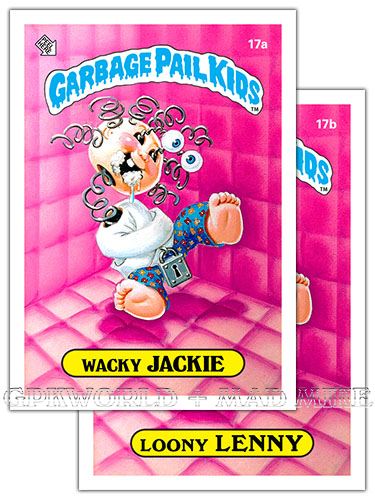 The only set that has the GPK header with the 'TM' () Trademark Symbol on the card front and wrapper; not including the Giant 1st Series cards which has the ® registered trademark symbol since it was released later during the 2nd Series when the registration for the trademark had been processed. 2. Glossy-finish and Matte-Finish card backs have been found in both print runs of the 1st Series release. A possible production error or an difference in how the reverse card was treated; most older Topps sets have card backs with the matte-finish treatment; especially movie tie-in cards. 3. The first of two GPK Series sets that have stickers with a Pink Header instead of the regular red or blue header logo for cards 12a Furry FRAN and 12b Hairy MARY. 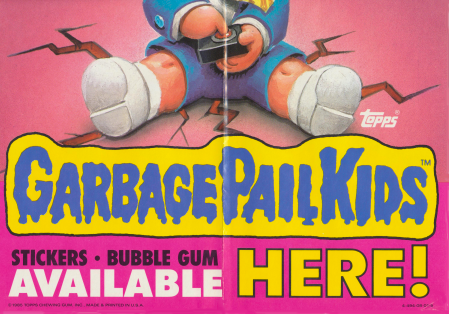 Visit the 4th Series page to view the second pink GPK header. 4. The only GPK Series with No Puzzle; the releases going forward will all have one or two puzzles per set on the reverse card. Per Mark Newgarden, a puzzle was never discussed for the OS1 set. 5. The only GPK set that has a red and Yellow Header for cards 18a Cranky FRANKIE and 18b Bad BRAD. This helps the logo, usually in white, not blend into the all off-white background of the artwork; the logo color matches the character's clothing color pattern. One of the original concepts by Mark Newgarden had the infamous red and blue Raggedy Ann doll being stuffed into the grinder; it was ultimately changed to the red and blue books late in production for the release. Visit the 'ART Gallery' for more information and visuals. 6. The only GPK Series box and poster that has a Blue Header surrounded by the color yellow -- pictured above in the 'Product' section. 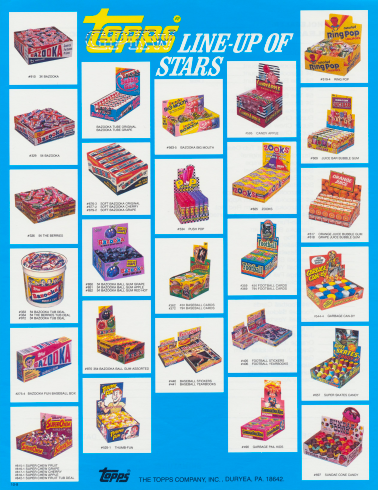 Several GPK boxes and posters can be found with this same or similar color pattern. 7. The set has a Light Pink, dark blue, dark pink (magenta), yellow, and red Nameplates ... no light blue nameplates in this series. 1. 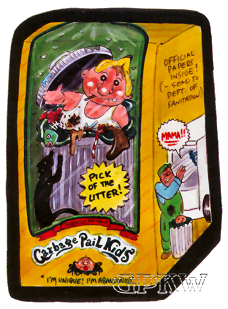 An Unpublished Wacky Packages concept titled Garbage Pail Kids was pulled from production and never made the 1985 release. 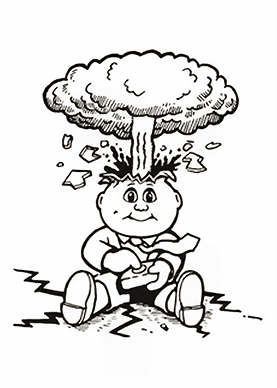 The term Garbage Pail Kids and the unpublished 1984 prototype were created by Mark Newgarden. Topps was in cahoots with the doll-makers of the Cabbage Patch Kids to possibly produce a card set,but OAA eventually turned down the deal. Topps was a bit peeved and a new parody series had been born. The final Wacky artwork was completed by John Pound who had worked on the 1985 Wacky Packages release with several other artists. Pound went on to draw and color the card fronts for the first two GPK Series and more than half of each sets thereafter. Tom Bunk completed the reverse card artwork and started card fronts during the 3rd Series set while Mark Newgarden rendered or wrote the card backs. 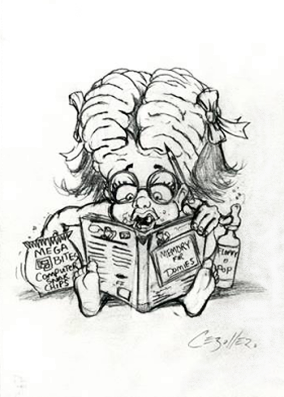 The red banner 'Juvenile Doll-inquent' on the concept became 'Gargabe Can DAN' for the final artwork which may have been the initial idea that gave way to the later GPK nomenclature. 2. 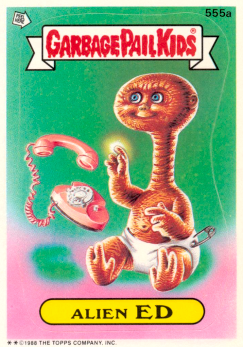 During the developmental stage of creating potential new product, the art team created a Mock-Up Card using a test piece that was painted by John Pound using the curved Cabbage Patch Kids-esque logo taken from unreleased Wacky Packages GPK image (image above). 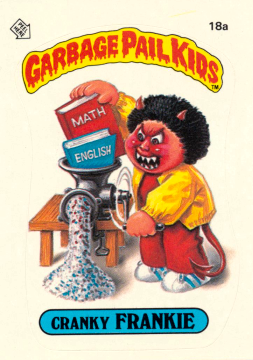 The curved GPK logo eventually became a dripping blood-like substance. 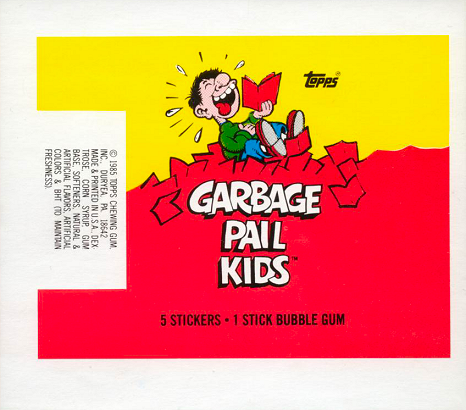 The black vignette outline seen on Wacky Packages for die-cut purposes is present on the image. The nameplate concept of 'Baby Barfy' was later changed to un-proper phrases with popular first name; the eventual use of two different names for each image doubled the set and future sales. The side notes on the mock up picture suggests using an air-brushed gradation of bright or pastel colors which shows up in John Pound's brilliantly executed air-brushed backgrounds. 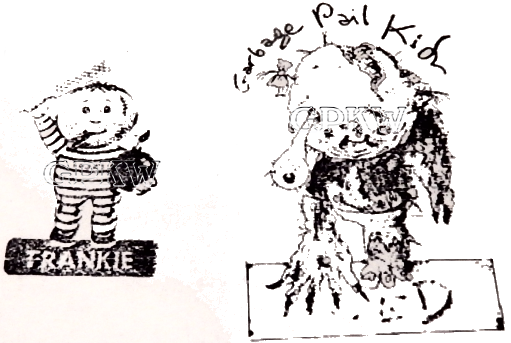 Several internal Topps sketches were also turned in for possible concepts for the GPK project: a 'FRANKIE' image by Gary Gerani with a final image painted by Mae Jeon that shows subversive character humor. A second sketch by Art Spiegelman showing a more perverse character 'NED' with a more grotesque vision similar to previous Topps releases such as Ugly Stickers by Basil Wolverton and Norman Saunders. Three artists were assigned to this concept, John Pound, Robert Grossman and Howard Cruse; out of the three John Pound was chosen to complete the art for the new parody set. 3. The Topps Chewing Gum (T.C.G.) company released the Nutty Awards Postcards in 1964 which were completed by Jack Davies. 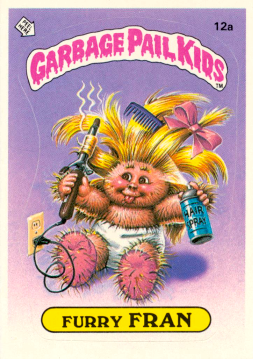 In 1985, the Topps company rendered almost every idea from this set for the 1st Series Garbage Pail Kids card backs, 20 years later. Artist Tom Bunk reworked and created new art for the backsides and drew the spiral border while Mark Newgarden rendered the writing as well as creating new material including the ribbon artwork in the bottom right hand corner. 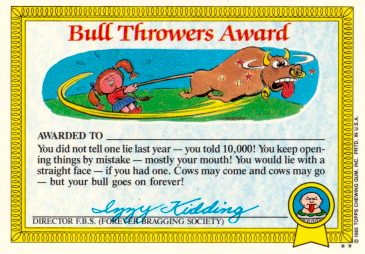 Out of the 32 Nutty Awards card set, 31 of these concepts were used in the GPK release. 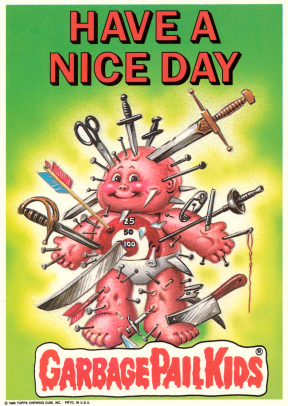 In 1967, the Topps Chewing Gum company published the 44 card Kooky Awards Stickers set painted by Norman Saunders and five completed by Tom Sutton; several ideas were recycled from the 1964 Nutty Awards Postcards set which in turn were used on the majority of the card backs for the 1985 Garbage Pail Kids set. 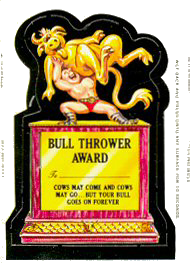 The following example for the 'Bull Throwers Award' which can be found in all three sets used the same tagline at the end "Cows may come and cows may go - but your bull goes on forever!" 4. During the process of developing a new product test products are sometimes created from existing releases. 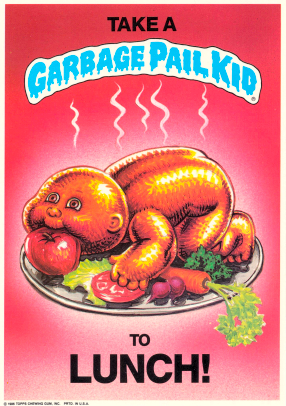 The first Prototype Wrapper for the Garbage Pail Kids was rendered from the Funny Li'l Joke Books set using the wrapper. 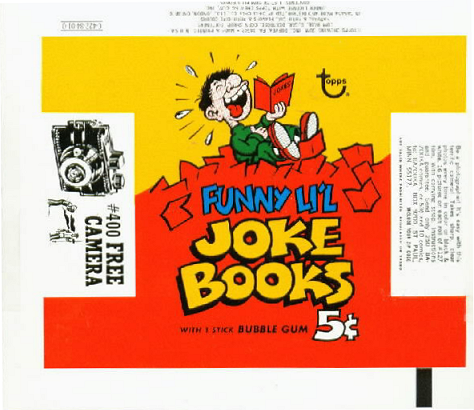 The Funny Li'l Joke Books set of 44 was released in 1970 -- notice the old Topps emblem and price tag of 5cents -- and completed by Art Spiegelman, Jay Lynch, Ralph Reese, Wally Wood, Rich Varisi and Tom Sutton The 1st Series Garbage Pail Kids set of 44 x 2 was released in 1985 with the new Topps emblem and a price tag of 25cents. Topps eventually went with a drastically different look. 5. The Wrapper Artwork was later rendered by artist Tom Bunk from the ADAM Bomb character painted by John Pound. 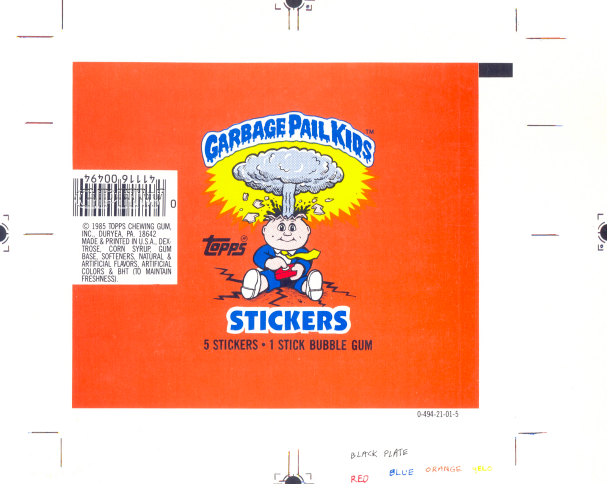 The popular image would be used for the wrapper of the first five Original Series GPK sets -- the color rough concept can be seen below. The box and wrapper layout was designed Brad Kahlhamer, a staff member within the NPD (New Product Development) department, along with the rest of the GPK crew. The NPD staff picked what character ended up on the wrapper and box, what color the packaging would be and what image ended up as puzzle characters (for later releases). 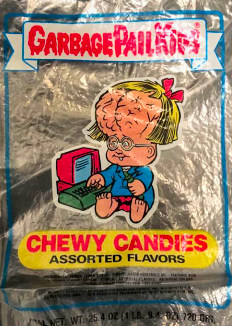 The tight ink artwork was also used for the GPK Chew Candy bag and wrapper as well as on the checklist for the GPK Cheap Toys release. 6. 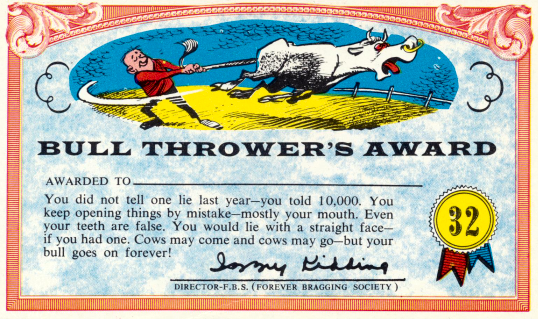 A 1st Series Wrapper Proof as auctioned off of eBay via the Topps Vault and resold in December of 2015; this type of 'wrapper' was submitted by Topps as 'proof of publication' to register the series title as a trademark months in advance. 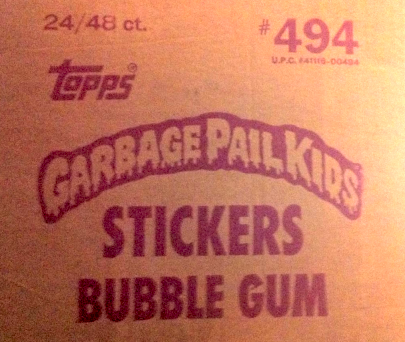 The '494' within the wrapper code (0-494-21-01-5) and UPC number identifies this product as Garbage Pail Kids, and most specifically, as the 1st Series; the '-5' in the code for the year 1985. This proof does not contain the '25¢ CHEAP' star that is often associated with the first wrapper for a series, identified as '-01-' within the product code. This is a proof to test the colors and layout of the item and not the final product -- the most evident change is removing the orange color and replacing it with the iconic pink color found on the ADAM Bomb card image, per the NPD crew, he was the obvious choice for the packaging mascot. The color red for the detonation box (black on the card image) was also replaced with the color pink reducing the number of colors needed for printing. Lastly, it's humorous to point out that yellow is spelled 'yelo' on the proof. 7. Per John Pound's notes and references card #5 'Have a Nice Day' and card #8 'Take a GPK to Lunch' from the 5x7 GPK Giant Series were Unpublished 1st Series (OS1) paintings. Giant card #5 'Have a Nice Day' has a #25 on the top left corner of the concept, color and final artwork pieces -- the number tells what order in which the artwork was completed by Pound. The image for OS14 cards 555a Alien ED and 555b Phone HOMER was also intended for the OS1 set but the eyes were reworked to match the new eye shape of the later GPK releases. All of the the pieces match the aesthetic feel of the OS1 set. This would have completed the 44 cardsheet for printing; any pieces removed would be replaced by duplicate artwork which led to card variations -- cards with different backs. 8. 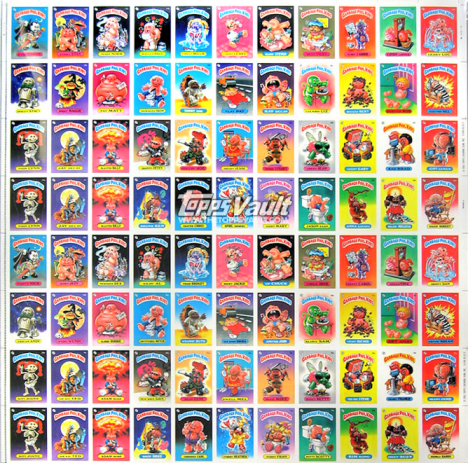 GPK Uncut Sheets were auctioned off of eBay through the Topps Vault in the Winter of 2007 (around November); A front image for the 1st Series GPK set (two 'b' sets and one "a" set) with the sheet code number 4-494-05-01-5. This uncut sheet contains the standard 44 card sheet formula that Topps uses during printing (132 cards per sheet) with the inclusion of three duplicate images due to the rejection and removal of artwork. 9. 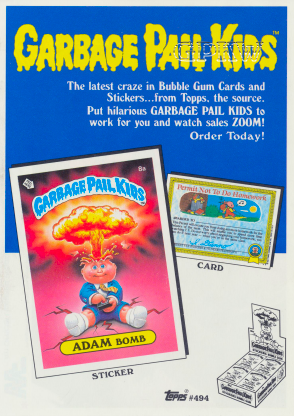 Artist Dave Newtown worked within the Topps Art Department under the tutelage of and worked on the first GPK T-shirt that went on sale during the OS3 release: "Back in the eighties I did the t-shirt art for 'Adam Bomb', which I think was the first Garbage Pail Kids shirt. We had 4 color process separations created but for some reason (Topps or my bosses?) we decided not to use them. They had me hand stipple all the color separations instead (this was in the pre-digital days). A very fun, but time-consuming, project!" 10. 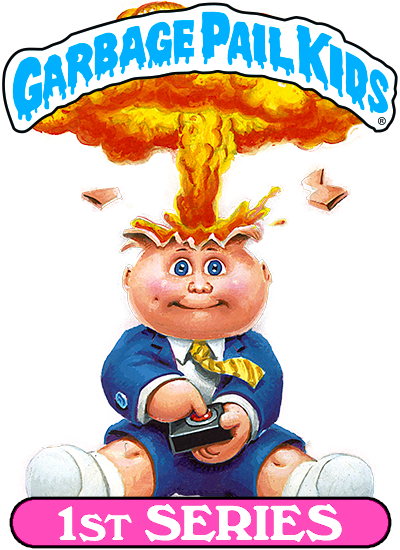 A set of twelve GPK Buttons was released in 1986 with seven 1st Series images and five 2nd Series images which, instead of a nameplate, contained an expression. The character image for cards 30a New Wave DAVE and 30b Graffiti PETEY was used for the GPK Button box artwork painted by Mae Jeon; the original artwork was auctioned off of eBay during July of 2008. 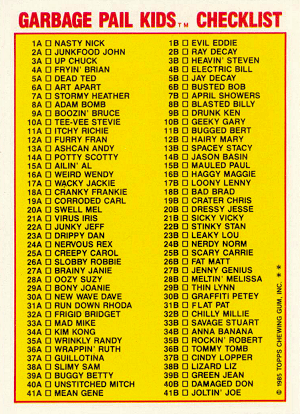 The characters for 1st Series cards 8a ADAM Bomb and 8b Blasted Billy and for the 2nd Series cards 42a PATTY Putty and 42b Muggin' MEGAN and 45a Leaky LINDSAY and 45b Messy TESSIE (with full snot strands) can be found as the button images on the box with blank nameplates. The die-cut is not the original sticker die-cut but a generic die-cut used for all of the buttons. 11. 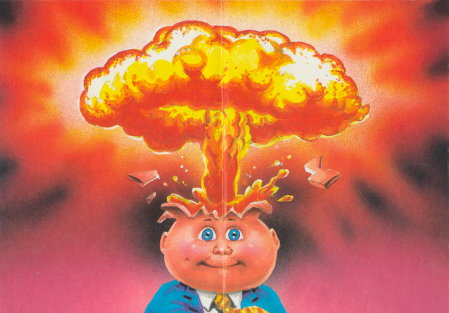 In 1989, Topps consigned artist John Pound to create a GPK image for their Rot 'n Roll Bubble Gum Cassettes product using characters from the 1st Series set. Characters 8a ADAM Bomb and 8b Blasted BILLY playing the keyboard, 3a Up CHUCK and 3b Heavin' STEVEN as the lead singer, 19a Corroded CARL and 19b Crater CHRIS playing the guitar and characters 14a Potty SCOTTY and 14b JASON Basin "playing" the drums. 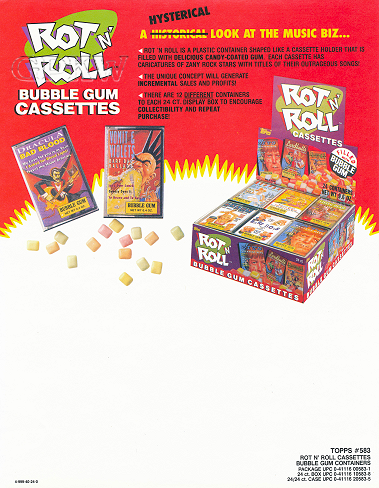 The label artwork became the mini-cassette insert and the tape case contained a gum-shaped cassette tape. The set was art directed by MAD Magazine co-editor Nick Meglin for the Topps company. The band members names (not the card nomenclature) can be found on the casette tape insert. Another version imported by Holland with ingredients in Scandinavian languages and slight changes is also available.The tight pencil, color rough, final product and sell sheet for The Barf Boys cassette tape. The product number 4-999-40-24-0 was released in 1990. 12. 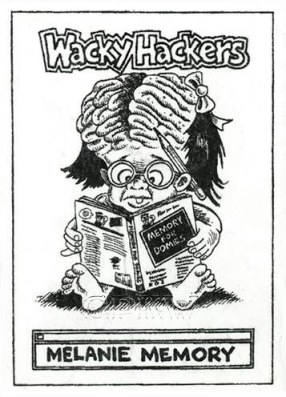 In August 2017 artist John Cebollero, who started working on GPK during the All-New Series phase, posted on social media a tight pencil he completed based off of a Jay Lynch concept for an unreleased Topps project titled Wacky Hackers; a mash-up of Wacky Packages and Garbage Pail Kids nomenclature and card design. Pre-production allegedly began in 1999 and lampooned popular video game box artwork and computer games; the sketches by Lynch were due in early February, 2001 and faxed in. Cebollero completed the final artwork for the image during production in 2001 but the project was eventually shelved, like so many Topps projects. 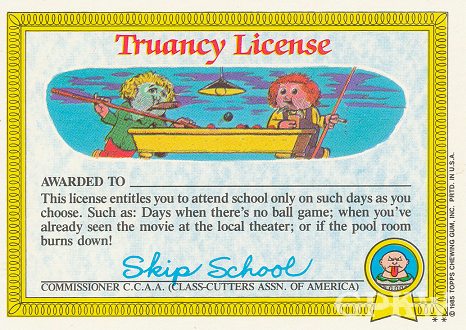 Lynch noted "RECALLING THE GPK CHARACTER BRAINY JANEY" for OS1 cards 27a Brainy JANIE and 27b JENNY Genius. 13. 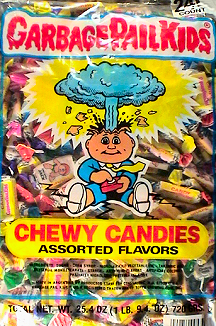 GPK Chewy Candy was produced in 1986 after the release of the 1st and 2nd Series sets and in 1987 after the trademark lawsuit. The candy product used characters from the 1st and 2nd Series sets as mascots on the candy wrappers. 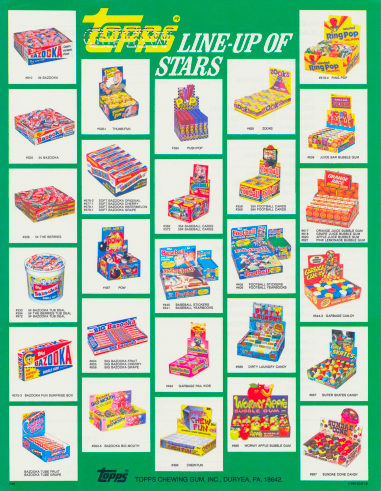 Three assortment of flavors can be found; cherry (blue and red wrapper), grape (yellow and purple wrapper) and strawberry (pink and green wrapper). 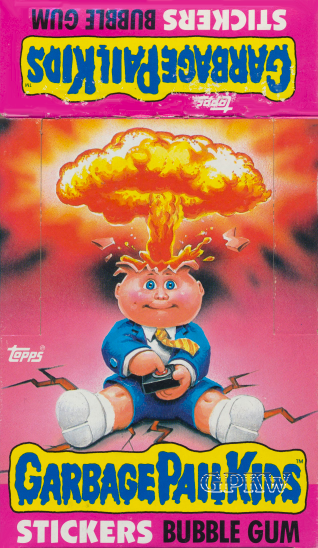 The images are very similar to the rendered artwork found on the GPK wax wrappers; however, the NPD (New Product Development) department at Topps in the '80s was responsible for the GPK cards, while the Art Department created the packaging and images for licensed products  oftentimes using in-house art staff or other freelance artists not associated with the GPK franchise. 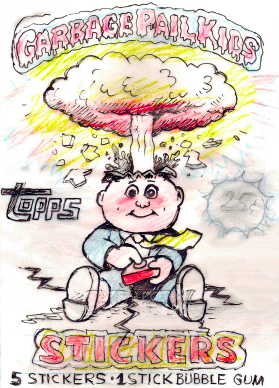 Although Tom Bunk worked on the image rendering for the OS1 thru OS16 wax wrappers, including the 8a ADAM Bomb image below, the remaining artwork was executed by artist George Evans. Five of these black and white rendered artwork pieces can also be found on the GPK Cheap Toys candy checklist. The product was made in Argentina (South America) by the Stani company for Confex, Inc., located in New Jersey and licensed by the Topps company. 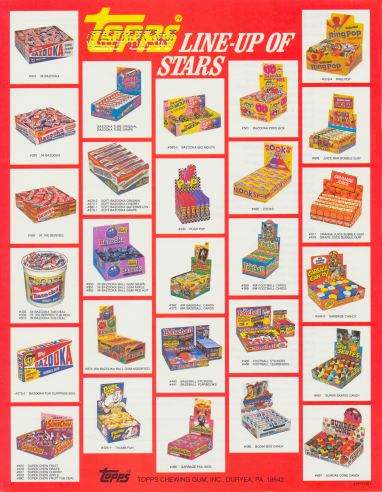 Various candy wrapper images can be viewed within the 'Art Gallery' above and within the 'Chewy Candy' page. 14. The Franchise would go on to spawn sixteen sets in the '80s (one unreleased), spin-off products and merchandise, international releases and a revival of the brand name in 2003 for many more sets and years of the Garbage Pail Kids lineage.